I studied BA(Hons) Fine Art Printmaking at Central St. Martins College of Art and Design between 1983 and 1986, followed by a year’s part-time postgraduate printmaking at Camberwell School of Arts and Crafts. 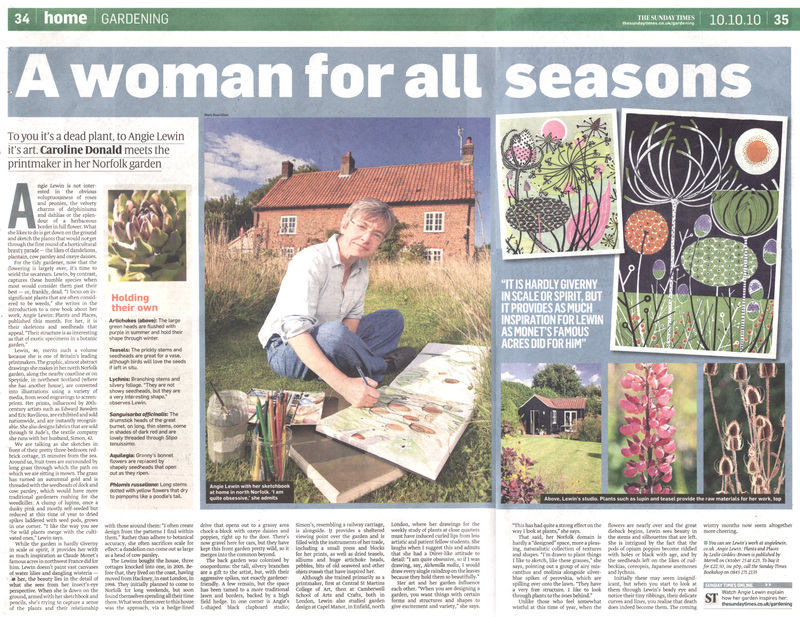 After working in London as an illustrator I studied horticulture and a move to Norfolk prompted a return to printmaking. Inspired by both the clifftops and saltmarshes of the North Norfolk coast and the Scottish Highlands, I depict these contrasting environments and their native flora in wood engraving, linocut, silkscreen, lithograph and collage. These landscapes are often glimpsed through intricately detailed plantforms. Attracted to the relationships between plant communities on an intimate level, even the fine lines of insect eggs on a flower bud are observed in my work. Still lives often incorporate seedpods, grasses, flints and dried seaweed collected on walking and sketching trips. A Wedgwood cup designed by Ravilious, may contain feathers and seedheads. “The whole book was, in its turn, inspired by the art of Angie Lewin, who brings her own vision of the natural world to her work. I now mainly live and work in Scotland. In 2010 Merrell published a monograph on my work, Angie Lewin - Plants and Places. As well as designing fabrics and stationery for St Jude’s, which I run with my husband Simon, I have completed commissions for Penguin, Faber, Conran Octopus, Merrell and Picador. I have also designed fabrics for Liberty. In 2006 I was elected to The Royal Society of Painter Printmakers and in 2008 to The Society of Wood Engravers. In 2010 I was elected to The Art Workers Guild. In 2016 I was elected to The Royal Watercolour Society. My work can currently be seen at these galleries. For details of all forthcoming events please see my exhibitions page. If you'd like to receive details of exhibitions nearer the time, please subscribe to my e-mail newsletter. You might also be interested to see some photos of my studio and some inspirational objects in this Flickr gallery.